China is making the most of a decline in India’s relations with Nepal. What benefits can Beijing reap? Tension has been mounting along the India-Nepal border after a 19-year-old Indian was killed when Nepali police opened fire on people demonstrating against the new constitution near the border. The incident came just hours after security forces baton-charged Madhesi protesters and evicted them from a key bridge in the area in a pre-dawn swoop. Nepali police burned down the tents of the protestors and evicted them from the Miteri bridge at the border, opening the main border trading point for the first time in 40 days. India-Nepal relations have taken a nosedive in recent weeks, with Kathmandu blaming India for growing fuel shortages, implying that India had imposed an informal blockade by not allowing fuel trucks to cross the border into Nepal. New Delhi blamed this disruption on the mass protests in the Nepali plains. Nepal imports almost all its oil from India and road links to China through the Himalayas have been blocked since the April earthquake. The disruptions underscore the Himalayan kingdom’s profound economic vulnerability, further inflaming anti-India passions. China, meanwhile, is likely to be a beneficiary of this turmoil in India’s periphery. As tensions with India mounted, China reopened its border with Nepal in Tibet. Historically, Nepal has had close ties with India. The political uncertainty in Nepal fueled anti-Indian sentiments, allowing China to enlarge its presence and even offer financial assistance for drafting the constitution. China overtook India as Nepal’s biggest foreign investor in 2013 with its funding of a $1.6 billion hydropower project – one of country’s biggest external investments. Against this backdrop, Indian Prime Minister Narendra Modi made Nepal a priority. He visited in August 2014 and also pledged $1 billion for reconstruction after the earthquake. It was the first bilateral visit to Nepal by an Indian prime minister in 17 years. Nepali politicians, across party lines, had welcomed Modi’s ascent in India, with most expressing hope that Nepal would be a beneficiary of his developmental agenda. The Nepali parliament invited Modi for an address, the first by a foreign head of state to that body since 1990, and the Nepalese gave him a rousing welcome. Modi’s speech was a graceful reflection on the trials and turbulence that have shaped Indo-Nepalese ties in recent years with a promise of a change of course. Though oil tankers are being slowly diverted away from the main choke-point on the Indo-Nepal border, India is constrained by the Madhesi protests. Ongoing disagreements over the constitution will not only mar relations with India, driving the government closer to China, but also challenge Nepal’s transition to a healthy democracy. 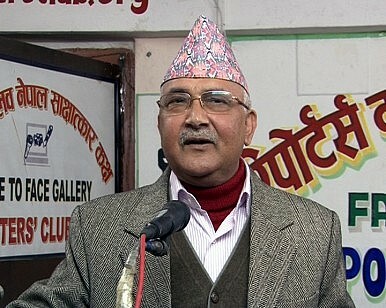 Nepal's prolonged constitutional crisis may be headed toward a solution. Do Kazakhs have a choice when it comes to the June 9 election? Amid a tense security situation, Kashmiris are largely unenthused by the national elections. Critical Shifts in India’s Outer Space PolicyAnatomy of a Taiwan Invasion Part 2: Missile and Naval DomainsIs the Taliban’s Former Capital Ready to Welcome Them Back?Tuberculosis: India’s Silent EpidemicWhat Will It Take for Cambodia to Actually Strike Oil and Gas?